The Academy of Christian Education provides a high-quality, academically accelerated program with a Biblical foundation. We use an accelerated curriculum for math, grammar, spelling, phonics, reading, history, and science. In addition, we add classic literature to every class. As a Christian school, we desire to honor Christ in all we do and say. During Bible time, we study the Bible, learn memory verses, and sing Christian and patriotic songs. Small class sizes allow for students to receive individual attention, so that each student can be nurtured and challenged at their own, individual levels for optimal growth and learning. All students participate in specialty classes each week, including STEAM, Art, Music, and Technology. In Art Class, students learn about different methods and styles of art and are offered the opportunity to practice such styles on a variety of mediums. The art work created throughout the year in Art is presented in May at an annual Art Fair. 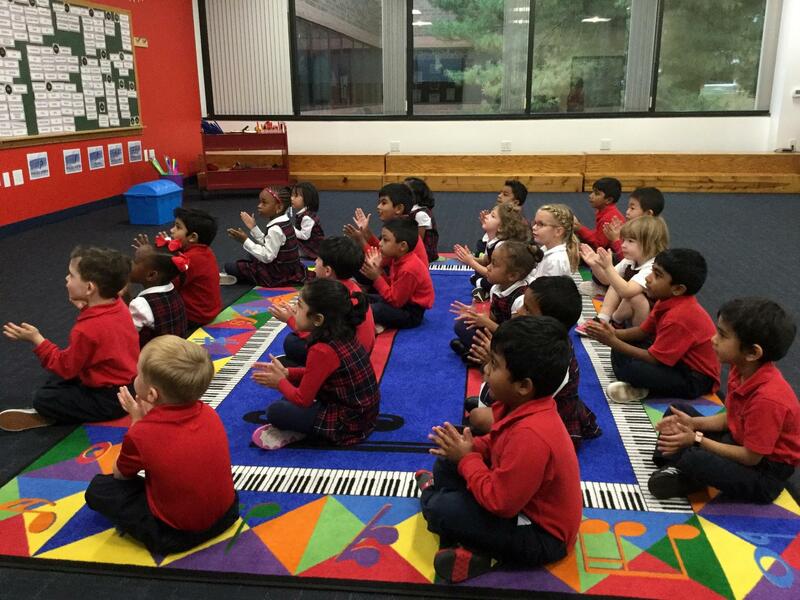 Music classes expose children to different instruments, musical genres and styles, and allow them to engage in creating music together. Elementary students learn to play recorders. All students are introduced to reading music and to different instruments. Each class participates in Christmas and Spring Programs each year to present what they have learned and accomplished together in Music. All students, Junior Kindergarten and above, participate in weekly PE classes. ACE hosts in an annual Fitness Challenge as a part of Physical Education Classes. Students learn the basics of how to play several sports, the importance of health and wellness, and learn about character in sports through teamwork and sportsmanship. 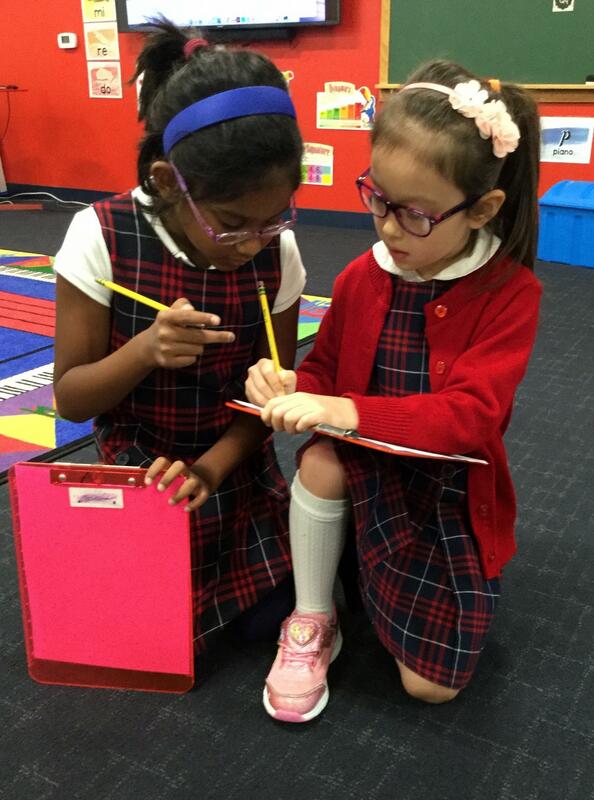 Beginning in Senior Kindergarten, each grade attends Spanish Class each week. While they are in an ideal age for developing language skills, Spanish classes provide the opportunity to for students to be exposed to the concepts of learning a foreign language in a fun and contemporary method using different technologies. 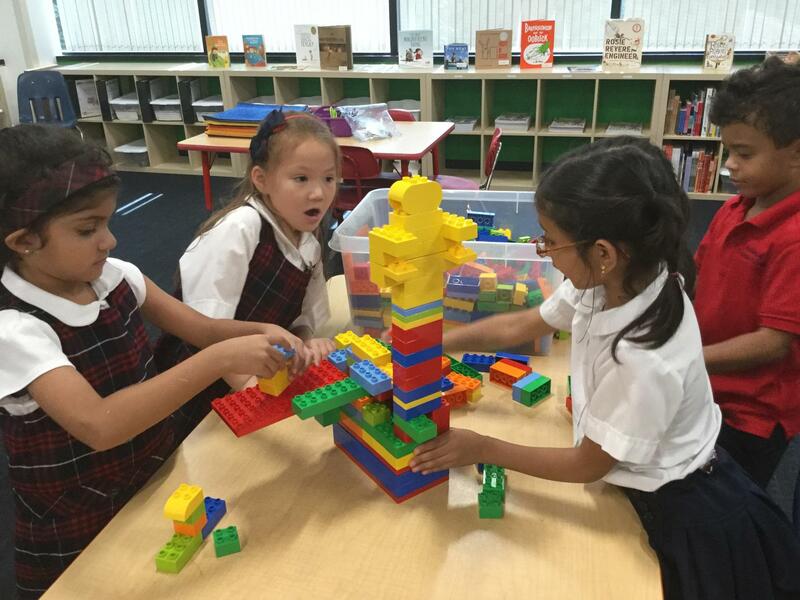 STEAM is an educational approach to learning using Science, Technology, Engineering, Art, and Mathematics as access points for guiding student curiosity, determination, and critical thinking. 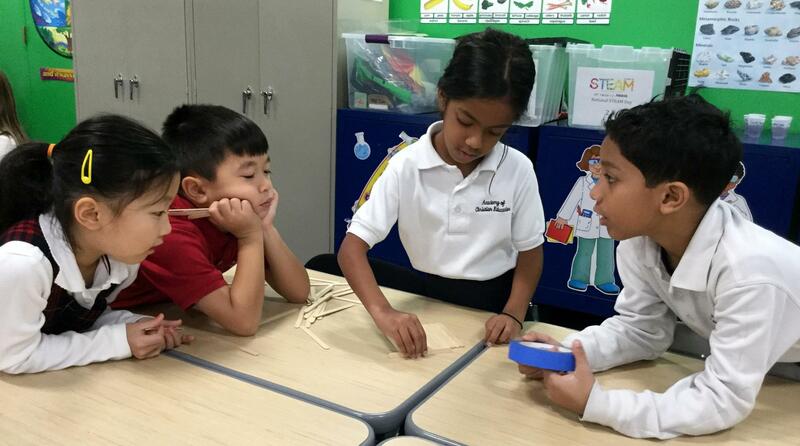 Each week, students engage in challenges that cultivate problem solving skills. STEAM helps students thrive academically as they are provided with opportunities to develop character skills such as perseverance, grit, optimism, and flexibility. In STEAM, students have permission to take thoughtful risks and are taught that failure is not a permanent condition, but a part of learning and the design process. STEAM education helps students build confidence while promoting a culture of lifelong learning and career readiness. We are very proud of our technology at ACE. In a digital world, we believe it is vitally important to consistently learn about and grow in the field of technology. 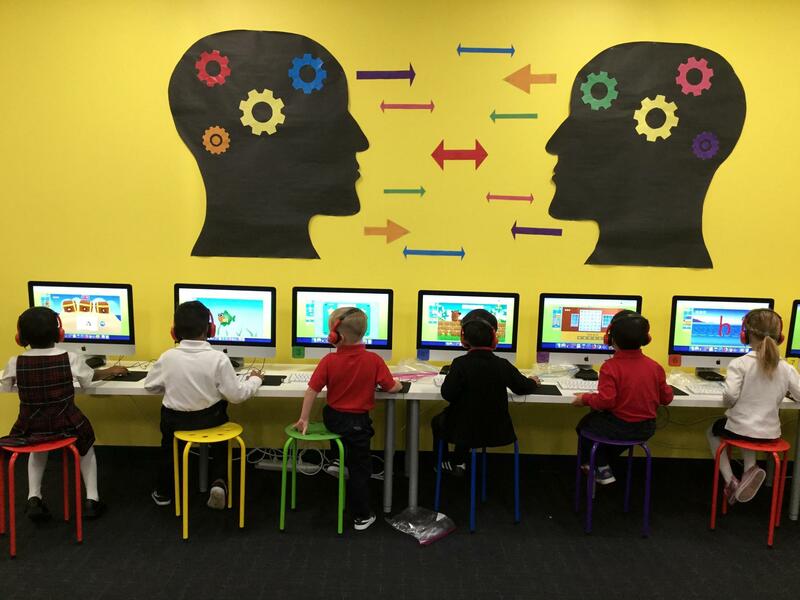 Technology classes are provided to each class in our state of the art computer lab. Students start by learning the basics of Internet safety, computer usage, logins and passwords, and learn everything from coding to Photoshop. Students are encouraged to develop research and critical thinking skills through Technology Class. Our Technology Lab is equipped with Apple workstations for each student in the class. We also have a mobile lab with iPads, which are used as learning tools. Each classroom has iPads for collaborative and independent study. Older students are issued iPads for independent work at school and home to help students develop critical thinking, logic, and collaborative skills. Throughout the year, students also use technology to develop technological skills, including Osmos, Bee Bots, touch typing with Keyboard Covers, and Spheros. Students do scratch coding with variables, conditional statements, and repeat loops. ACE Students learn functional technological skills, including typing, building spreadsheets, and word processing, balanced with exposure to creative uses for technology, such as Photoshop, graphics, and others. Because we value collaborative, immersive education, ACE classes have many opportunities to engage in special activities. We believe these activities aid in providing an interactive and fun educational experience - and that they correlate with our accelerated curriculum. Learning occurs outside of the classroom as students participate in field trips to reinforce classroom instruction. We also host special events at least once a month, including everything from International Days, to assemblies, Christmas and Spring Programs.